Fighting Parkinson’s, and okay, okay, okay! “‘Okay’ is the word I have come to use to denote acceptance followed by dealing with the issue and working toward a solution. There is a certain emotional detachment that comes with “okay,” but that type of clear-headed emotional detachment is what we need to beat this disease. However, I have to admit that it was Sally who first used the “okay” strategy when we realized I had Parkinson’s. Each “okay” meant this: “‘Okay,’ this is what is happening right here, right now, what am I going to do about it.” As you can see, this is quite different from, “My legs hurt, this means my Parkinson’s is worsening, soon I won’t be able to walk without a walker, soon after that I will be in a wheelchair.” “Okay” is a call to action. It identifies an issue and works toward a solution. The other response is emotions. It is fear and worry and anger about the future. It causes paralysis of the spirit, which causes paralysis of the mind, which causes paralysis of the body. This is the one situation where our fear of the walker and wheelchair, and doing nothing about, will provide us the paralysis we need to end up with the walker and wheelchair…we will get what we fear. Why not try, “okay,” and then do something to provide a solution to the problem. What if we could say, “I have Parkinson’s and this is my Parkinson’s body…’okay.’” Accepting our Parkinson’s and our Parkinson’s bodies, with all of our newly discovered physical limitations and pains is part of the process of recovery. 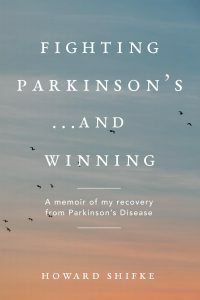 After Sally said let’s put a plan together, I read the book, What your doctor may NOT tell you about Parkinson’s Disease, by Dr. Jill Marjama-Lyons. It covered the medication and alternative approaches to dealing with the disease. The thing is, I did not want to “deal” with the disease and I did not want to “maintain” the best possible life with the disease. Simply put, I did not want to have the disease, which is something we all have been told is impossible. However, recovering from Parkinson’s without medications was the only alternative for me. Faced with what I felt was the only alternative for me, I got on the path toward recovery and I never got off. As it worked out, it was a good thing that I saw this as my only alternative because it was not easy. I was reminded of this in a coaching Skype recently when I said to the person, “Thank you for working so hard and sticking with the Recipe.” She looked at me and said, “What’s the alternative?” I smiled and explained that was exactly how I felt. Here we are one year later and I would not change a word. You are so much more than your Parkinson’s symptoms! Do not live your Parkinson’s symptoms. Nothing good comes from that. Live your life. Do not just be alive, but actually live your life and find joy in your heart. Seize the opportunity. Grab onto the Recipe for Recovery and seize the opportunity to recover! So, you have Parkinson’s…okay! What are you going to do about it, right here, right now? Why not say, “okay,” get on your path to recovery with the Recipe for Recovery, and stay on your path to recovery until you fully recover. 12 Responses to Fighting Parkinson’s, and okay, okay, okay! jUST KEEP MAINTAINING AN “ATTITUDE OF GRATIUDE” ALSO HELPS A BUNCH. Okay….okay…okay…. I can’t hear this enough, Howard….thank you for continuing to inspire…..
Well put. You are a continual source of inspiration. Thank you. I have been using okay increasingly over the last few days and although my tremor has become even worse as I increase my qigong practice,my walking has become better.Acceptance of myself,others and my environment is proving most beneficial. I trust in my recovery. When I was suffering, Howard taught me to say “okay” to my symptoms and my situation. Parkinson’s is in my past, but what I learned on the road to recovery is still part of my life every day, and for that I am so grateful. Even beyond Parkinson’s, there is still much benefit to be gained from the wisdom of the Recipe for Recovery . There are still so many occasions when I need to say “okay”, and move on from there. Okay! I have Parkinson’s disease. Okay! I move slowly. Okay! I write slowly. Okay! I have pain. Okay! I have difficulty doing household chores. Okay! This is what I’m going to do about it: I’m going to continue doing the recipe for recovery as long as necessary until I recover. Period! Thank you, Howard, again for your encouragement. Thank you for your relentless pursuit of recovery for all! I am grateful for all of you who posted comments, and those of you with whom I have spoken or from whom I received emails about this post. I, like Marie, still use “okay” and move on from there in my post-Parkinson’s life. It puts things in perspective and controls the mind and emotions…okay! thanks howard .i use OKAY too .